Is There a Cycle to Religion? With the rise and fall of civilizations comes the rise and fall of religion. Are we due for a new religion to be born, or to have a rapid growth of popularity? Christianity grew rapidly during the fall of the Roman empire, and with the persecution of believers, where are we today in this cycle? Thank you for your education. I’ve read your blog since I was in high school and realize how life is governed by cycles. Some weeks are rough, some are fantastic, but it all regresses to the mean eventfully. ANSWER: Oh yes. There is a Cycle of Religion that prevails throughout all cultures. It is clearly tied to economics and the business cycle. I am sure some people will naturally disagree with that one, but it cannot be removed from the business cycle itself. Religion has so often inspired war with some even called Holy Wars. 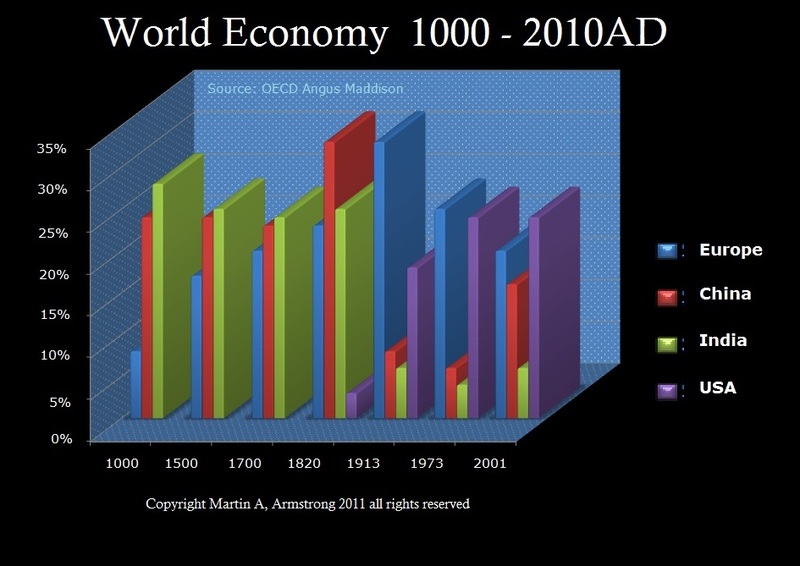 The dominance of a given religion has turned with the economy. The rise and fall of civilizations have been clearly linked to religion. Even if we go back to the Stone Age, we find graves with goods place in there with the deceased with obvious demonstrations of love as well as a belief in an after-life. Burial rites characterize religion and extend back into the Middle Paleolithic, as early as 300,000 years ago, coinciding with the first appearance human communities. Religion is an integral part of the entire human society. But keep in mind that this goes beyond the simple shifts from Paganism to Christianity and the rise of Islam. There are cycles within each as there are cycles in Asian cultures and religions all tied to the business cycle. The English Civil War was the Protestants against the Catholics which ended up beheading the King. 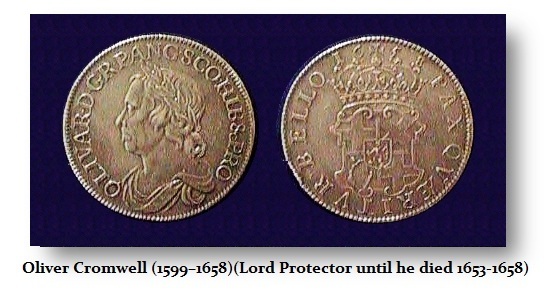 The Puritans seized power under Oliver Cromwell who placed his own portrait on coins wearing a wreath as if he were a Roman Emperor. The Puritans outlawed kissing your wife in public, plays, all sports, and celebrating Christmas. They were so strict that the Protestants rebelled and overthrew the Puritans. It was the Puritans who infected the United States for they were the Pilgrims. This illustrates that there were subcycles within the same religion and the cycle does not always involve Christianity against Islam or Pagans. During the 3rd Century, as the Roman Empire was economically imploding and the barbarians were at their gates, this is when the persecutions of the Christians became common. The Pagans believed Rome was being punished because the Christians were not worshiping the gods. 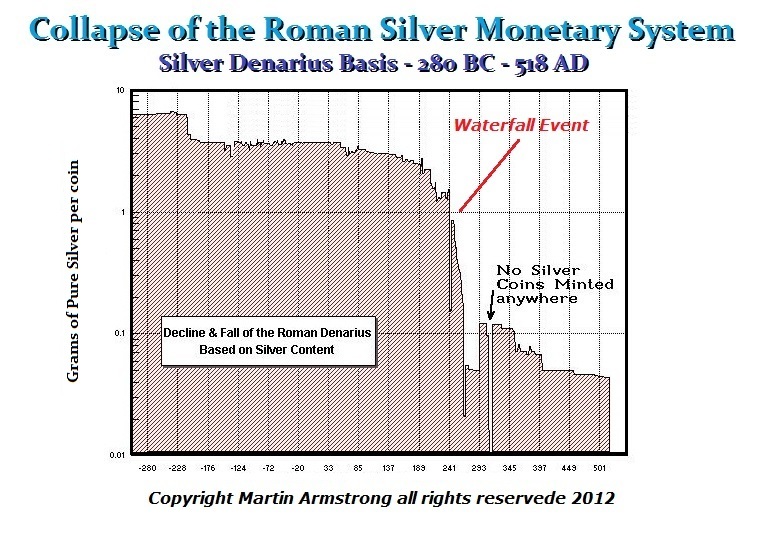 When the Christians became the majority inspired by the economic collapse of Rome, then they turned against the Pagans and persecuted them. 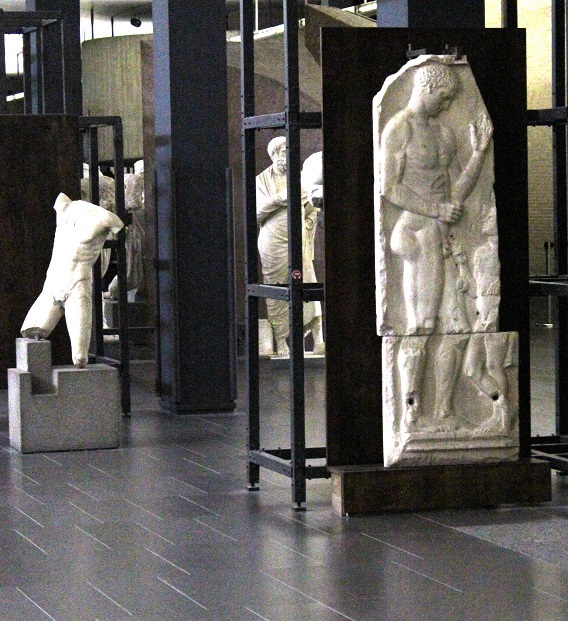 We see collections of ancient sculptures many are beheaded and defaced. This was the Christians assuming and sculpture was a god. If we look at China, we can see quite easily how religion and the business cycle were interlinked even in Asia. The Chinese emperor was seen as being handed the Mandate of Heaven (天, Tian). The Chinese economic, political, and religious doctrine that supported the rule of the Emperor of China was a belief that heaven embodied the natural order and will of the universe. Therefore, it was this natural order that gave the mandate to the ruler of China for he was the “Heavenly Son” of above. In order to maintain that philosophy, if the emperor was overthrown, this was interpreted that the ruler was unworthy, offended the universe, and had therefore lost the mandate. They also believed that natural disasters from earthquakes, famine to floods were all signs from Heaven that the emperor wronged the Heavens and such disaster would often justify revolts of the people. 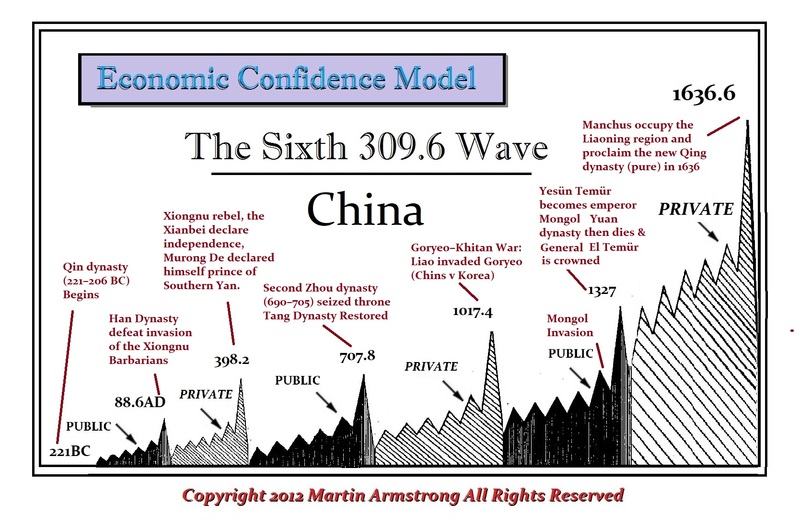 We see how this belief system interpreted the fall of China to the Mongolian invasion. Genghis Khan began the conquest of China with just raids in 1205 and 1207 across the border. However, by 1279, Kublai Khan had established the Yuan dynasty in China crushing all resistance, which was the first time in history that China came under the rule of a foreign or non-native power. Most people in the West know little about the history of China. They saw the movie the Last Emperor and assumed that the Emperor ruled until the Communist Revolution in 1946. In reality, following the outbreak of the Wuchang Uprising against Qing Dynasty rule in 1911, the revolutionaries elected Sun Yat-sen as the “provisional president” of the transitional government, with the Republic of China officially established on January 1, 1912. More like the UK, the Chinese Emperor was not eliminated, just the political-economic power. It was against this republican form of government that the Chinese Communist Revolution was launched in 1946 following the beliefs of Karl Marx. Finally, on October 1st, 1949, Mao Zedong proclaimed the establishment of the People’s Republic of China ending the Emperor forever. There is nothing that is exempt from cycles be it the economy, seasons or even religions. The Hindus believed their religion and gods are invincible not much different from the Romans. Hindus were prosperous, powerful, and became economically very rich and therefore known as was Rome or the United States. They believed that would last forever as every society does. They believed they are special, which is also a common theme. They believed that their gods were in charge of the world as well as the universe. Their culture and community also experienced a very difficult time adjusting to the reality of their collapse. Like the Romans, the Hindus also believed that their gods would bring all good things back and restore them to their former glory. Some resorted to extreme devotion and concluded the same as the Pagans of Rome that their fall was because there was not enough devotion. In the United States, Rev Jerry Falwell and Pat Robertson came out and said that God was angry and punishing New York allowing the terrorists to succeed on 911. They said God allowed the attack because of “abortion, homosexuality, secular schools and courts, and the American civil liberties union.” (see Guardian). This is the standard reaction when fortune shifts. Many will blame some group that God is punishing the entire community because of these people. This human response was the same in the Hindus as it was among the ancient Romans and Greeks. Socrates was sentenced to death for corrupting the youth and offending the gods. It is not clear whether he believed in just one God or many. The Greek word Plato used in the original text is “θεός” (theos) which is translated to “God” or “the deity”. Nevertheless, “θεοί” is the plural form of “θεός” and Plato also used this in sections of his Phaedo. Plato does indeed use both the singular and plural forms in the text. Christianity went through dark periods of the cycle of religion. Because Roman bathhouses were communal and were places one went to even for prostitutes, when Roman fell, bathing was then connected with sin. Mathematics also became associated with the Devil. The entire idea that the Earth was flat and the center of the universe emerged from the idea of heaven and hell and there had to be an up and down. Bruno was burned alive for saying the Earth revolved again the Sun. The Church jailed Galileo (1564-1642) for believing the same concept. The knowledge that came from the fall of Constantinople in 1453 introducing schools brought the West out of the Dark Ages. But this took time. Christopher Columbus had maps that came from the East and set sail to discover America in 1492, about 40 years following the fall of Constantinople. Every religion undergoes a cycle of change. It does not matter which religion we are talking about. Nonetheless, this is tied to the business cycle. When economic decline hits, we see rising civil unrest as one group blames the other for their ways and non-devotion. Islam and Christianity preached a level of equality, which provided a flat social structure as distinguished from a class system. This was the foundation of capitalism for people were allowed to change their professions at will and new converts to their religions were welcome. Hinduism, on the other hand, has a rather strict ordered and hierarchical structure of society. This structure was flexible at the beginning and the ancient texts contain examples of people changing their castes. Over time, this flexibility was lost and the caste began to be decided at birth. Islam regarded stealing severely where Christianity was more forgiving, but the government and Christain Fundamentalism turned to the unforgiving policies that have led the United States to have almost 25% of the total world prison population when it has only 4.4% of the world’s population. People are imprisoned for any offense whatsoever. If you drive on federal property and do not have your drivers license on you, you MUST go to jail and will be given typically a sentence of 30 days. 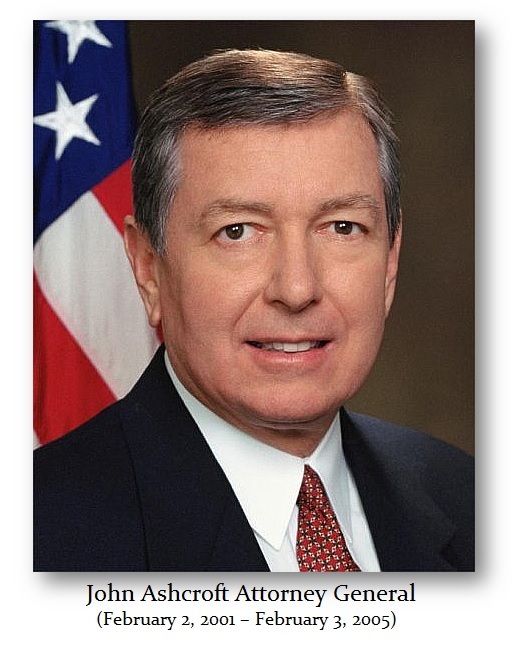 When John Ashcroft was Attorney General under Bush, Jr., he imposed his unforgiving religious belief system upon the nation. Prosecutors would not get credit for a mere conviction. The defendant MUST do some jail time. It was Ashcroft who has turned the United States into the most anti-Liberty nation on the face of the Earth. Nobody imprisons people for every offense no matter how minor than the US Federal Government. Islam and Christianity both demand absolute faith in their own version of God. Hindus are much more tolerant of what you should believe, but conversion to Hinduism is more difficult than that to Islam/Christianity. In polytheist Hindu system, if you want to bring in your god, then it is just one more idol in the already crowded temple of Gods. Hinduism offers a rich variety of texts and encourages debate as well as the pursuit of knowledge. Hinduism and most other Eastern religions, tend to believe that humans are part of the environment and that animals and plants should all be respected. Western religions, including Islam and Christianity, tend to accept the principle that humans are created in the image of God and are therefore a superior species on the planet which was created for humans. So there are differences in philosophy between East and West. In the East, they tend to believe in cycles as part of nature where in the West the core starting point was linear. That said, there are cycles in the belief system but there are also cycles within each religion.